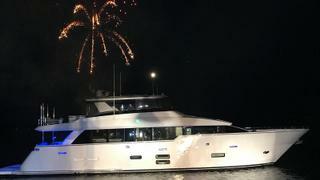 American boatbuilder Hatteras has showcased its new M90 Panacera motor yacht at a spectacular event in New Bern, North Carolina. Due for a public debut at the 2017 Fort Lauderdale International Boat Show, the new 27.95 metre model was given a dazzling premiere last weekend (September 14-15) at the Hatteras Club Experience accompanied by fireworks. This new model continues the company’s lineage seen in the Hatteras 100 Raised Pilothouse yacht Scorpio and the 70 Motor Yacht series, with deep hull tunnels that allow for a shallow draught of 1.72 metres. Power comes from a pair of 1,600hp Caterpillar C32 ACERT diesel engines that deliver a cruising speed of 22 knots and a range of 428 nautical miles. The M90 Panacera will be available in both open and enclosed flybridge versions and will benefit from Hatteras’ resin-infused fibreglass construction technology, which ensures the hull has the ideal strength-to-weight ratio. It also will house a recent Hatteras innovation — a 12,435 litre fuel tank that is integral to the hull rather than being a separate box, which provides greater fuel storage as well as weight savings. The M90 Panacera has a flexible interior arrangement — the standard layout places the galley forward along with a casual seating and dining area, while the formal dining table and salon lie aft. 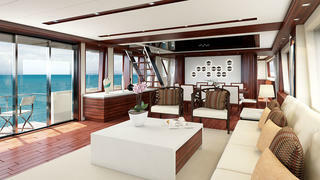 An optional arrangement can move the galley amidships and the dining table aft, creating a saloon forward. 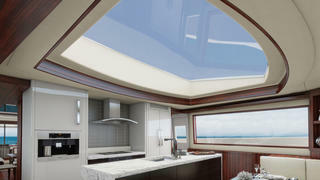 The galley will also incorporate a dimmable glass skylight that measures five metres by three metres and will enhance the feeling of height and light. The main deck windows are large and frameless, maximising views and the Hatteras design team has also created optional fold-out balconies for the main deck that are incorporated into the bulwarks. The lower-deck has accommodation for eight guest in four staterooms, all with en suites. The crew quarters are situated aft of the engine room and encompass a captain’s cabin, crew bunkroom, shared head and galley/lounge area. They can be accessed from the yacht’s transom and also from a discrete door on the aft deck, located beneath the stairs to the superyacht sundeck. On deck there is large aft deck settee and dining table. 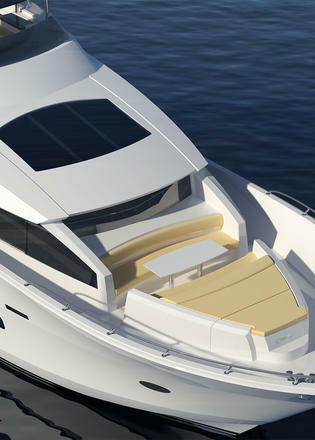 The foredeck also holds a settee, cocktail table and a large sun pad — an optional layout includes fore and aft-facing benches served by a table. Those keen to learn more will have to wait until November, when the M90 Panacera will be given a FLIBS debut.